Indium Corporation employees gather outside of the first company location at 805 Watson Place in Utica. Dr. William S. Murray founded Indium Corporation of America in March 1934. 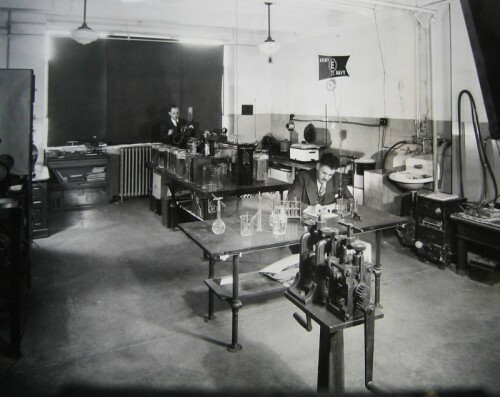 In the early days of Indium Corporation, technologists work in a lab with the U.S. Army/Navy “E” Award for Manufacturing Excellence hanging behind them. This honor was presented to the company during World War II for excellence in the production of aviation equipment. 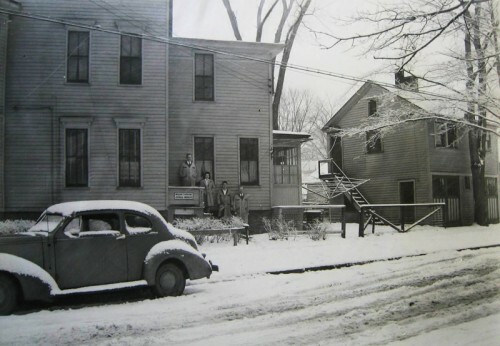 CLINTON, NY – What does it take to make it to 80 years in an industry where today’s technology is obsolete tomorrow? For Indium Corporation, it takes foresight and dedication. Dr. William S. Murray – a man dedicated to investigating the uses of indium metal – founded Indium Corporation in 1934. Since those early days, Indium Corporation has continued to lead and support the advancement of technologies on which we rely today. With more than 750 employees globally, several company technology experts share their reflections on Indium Corporation’s impact on the past, as well as future goals. Indium Corporation's story begins in 1863 when the element indium is discovered by F. Reich and T. Richter while at the Freiburg School of Mines, Germany. For years, scientists Dr. William S. Murray and Daniel Gray would study the metal in hopes of discovering new ways to process and use this substance. After much trial and error, they succeeded and a number of patents followed, including processes for obtaining indium and zinc, electrodepositing indium, and recovering indium, to name a few. March 13, 1934: Indium Corporation is founded in Utica, New York, U.S.A.
1938: Indium Corporation develops the process and technology to plate the first indium-treated aircraft engine bearing, revolutionizing the aviation industry. 1942: Indium Corporation receives the U.S. Army/Navy “E” Award for Manufacturing Excellence during World War II for the superior production of aviation equipment. 1952: A commercially-viable process for the production of precision solder preforms was developed, enabling the mass production of alloy junction transistors and paving the way for the commercialization of the transistor radio. 1959: The United States patent office issues a patent for "Printing Circuits And Method Of Soldering The Same" to the Indium Corporation. This invention offers improvements to the process of soldering to printed circuit boards via enhancing the solderability and soldering of component leads and circuit board conductors. 1960-1965: Indium Corporation develops indium inorganic compounds, including: indium oxide, indium-tin oxide, indium chloride, and indium hydroxide. These are later widely used to enable touch screen and flat panel technologies. 1960s: Materials made by Indium Corporation are used to help seal containers that bring rocks back from the moon. 1970-1980s: Solder paste and spherical solder powder manufacturing capabilities are developed by the Indium Corporation. These products were key materials in advancing computer, printer and cell phone developments. 1989-1990: Indium Corporation participates in multiple experiments aboard multiple space shuttle missions. 2009: Indium Corporation acquires Reactive NanoTechnologies, Inc. (RNT), a developer and manufacturer of NanoFoil®. NanoFoil creates a precise, controlled reaction to rapidly join two surfaces. It is used in a variety of applications including biomedical, automotive, aerospace, semiconductor, and electronics. 2011: Indium Corporation introduces the world’s first water-soluble flux for 2.5D and 3D chip-on-chip or chip-on-wafer assembly, which increases the reliability of consumer electronics. 2012: Oneida-Herkimer-Madison County BOCES School and Business Alliance honors Indium Corporation with the Shining Star Company Award for its conscientious approach to providing quality job-shadowing experiences. 2013: Indium Corporation receives international recognition, including the Global Technology Award, for its invention of SACm™ solder alloy, used to replace Pb in electronics assembly operations. Today, Indium Corporation is a premier materials manufacturer and supplier to the global electronics, semiconductor, solar, thin-film, and thermal management markets. Its products include solders and fluxes; brazes; thermal interface materials; sputtering targets; indium, gallium, germanium, and tin metals and inorganic compounds; and NanoFoil®. Founded in 1934, Indium has global technical support and factories located in China, Singapore, South Korea, the United Kingdom, and the USA.